We truly are all connected…. There was the cycle of the mineral, the rock. There was the cycle of the plant. And now we re in the cycle of the animal coming to the end of that and beginning the cycle of the human being. When we get into the cycle of the human being, the highest and greatest powers that we have will be released to us. They will be released from that light or soul that we carry to the mind. But right now we’re coming to the end of the animal cycle and we have investigated ourselves and learned what it is to be like an animal on this earth. To the West He gave the black race of people the Guardianship of the water. They were to learn the teachings of the water which is the chief of the elements, being the most humble and the most powerful. When I went to the University of Washington and I learned that it was a black man that discovered blood plasma, it didn’t surprise me because blood is water and the elders already told me the black people would bring the teachings of the water. To the North He gave the white race of people the Guardianship of the fire. If you look at the center of many of the things they do you will find the fire. They say a light bulb is the white man’s fire. If you look at the center of a car you will find a spark. If you look at the center of the airplane and the train you will find the fire. The fire consumes, and also moves. This is why it was the white brothers and sisters who began to move upon the face of the earth and reunite us as a human family. I talked to people from the black race and their stone tablets are at the foot of Mount Kenya. They are kept by the Kukuyu Tribe. I once had the honor of presenting a sacred pipe at the Kukuyu Tribe carved from the red pipe stone of Mount Kenya. I was at an Indian spiritual gathering about 15 years ago. A medicine man from South Dakota put a beaded medicine wheel in the middle of the gathering. It had the four colors from the four directions; He asked the people, “Where is this from?” They said, “Probably Montana, or South Dakota, maybe Seskatchewan.” He said, “This is from Kenya.” It was beaded just like ours, with the same color. The stone tablets of the yellow race of people are kept by the Tibetans, in Tibet. If you went straight through the Hopi Reservation to the other side of the world, you would come out in Tibet. The Tibetan word for “sun” is the Hopi word for “moon” and the Hopi word for “sun” is the Tibetan word for “moon”. 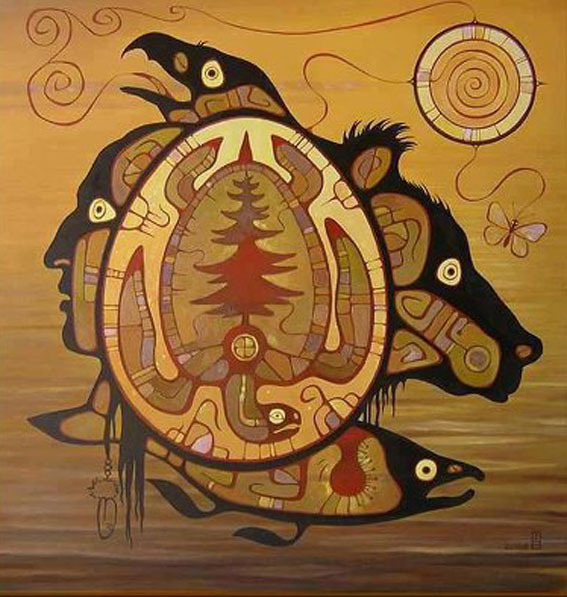 The elders knew that peace would not come on the earth until the circle of humanity is complete, until all the four colors sat in the circle and shared their teachings, then peace would come on earth. A good friend of mine in Montana whose grandmother just passed away last year, the last thing she said to him was “Make a place for yourself in the mountains because the air will become so hot down here,” where they were at on a reservation, that it would be hard to breath. And it won’t be long, That’s the last thing she told her grandson when she was passing. Go on the mountains and make a place for yourself. Put some things there that you can survive with. People are going to run to the mountains to survive and the Native people must be ready for this. Namaste and Love to all. Hi, i would like to know de origin of the image or illustration of this article, could someone give me information please. Thanks!! I honestly don’t know the origin Liliana, only know the meaning behind the image and the connection from one being to another within the circle of life. I do believe the image is original Hopi indian though. Such a beautiful story that highlights the importance of human beings. Namaste my kindred spirit friend.